On the way to viewing Reza Allamehzadeh’s documentary about Bahai persecution, the car radio program was about a 340 ton rock being dragged 60 miles to the Los Angeles County Museum of Modern Art. A surreal waste of effort, perhaps to make that very point! As it turns out, this extravagant expenditure of energy isn’t nearly as absurd as the efforts of the Islamic Republic to create terror and frustration for Iran’s Bahais. The difference is that while the artistic statement is a capricious waste, the Regime’s political statement is a malicious overexertion. There is no reason for it other than to cause suffering. The absurdity of this effort borders on the laughable. Why else would a film audience of over 400 burst into laughter as a wrinkled old Iranian villager innocently explains to the camera that she doesn’t know the way to Israel? The Bahai grandma was evicted from her own home by a gang of regime zealots, and when she asked where she should go now, they told her to go to Israel! In this touchingly impactful scene with confused elderly villagers, Allamehzadeh dispels the myth of Iranian Bahais as sophisticated members of an elite cult with deep ties to power. 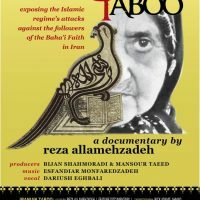 Throughout his documentary, Iranian Taboo, the filmmaker continues to smash, one by one, traditional misconceptions about Bahais. Is the Bahai faith a Zionist tool? After all the World Bahai Center is in Israel. In a visit to the center we find out that it was established in the Haifa/Acre region during the Ottoman Empire. The country of Israel did not even exist back then. Allamehzadeh interrogates a Bahai leader at the center to the point of rudeness to expose any special accommodations that Israel may have made for the Bahais, but comes up empty handed. Where does the money come from? What is the special Bahai card that Israeli customs officials ask for when Bahai pilgrims enter Israel? These questions have innocent, reasonable and believable answers. An eye opener for me was when Allamehzadeh broached the myth of Iranian Bahais being left in peace during the reign of Mohammad Reza Shah. In fact the Bahai situation was as perilous as ever because the Shiite clergy were relentless in pushing the Shah to persecute the Bahais. During episodes of political weakness, the Shah had no choice but to cave in to the wishes of the Shiite clergy. For example, a controversial photo of the queen published in Europe could give the clergy enough material to blackmail the Shah into withdrawing protection from his Bahai subjects. The documentary shows footage of Tehran’s Bahai center being demolished brick by brick by the Shah’s generals during one such episode in 1955. Things appeared better for the Bahais later in the Shah’s reign, but this was simply due to political fortune in the Shah-Clergy competition, not because the Bahai political pawn had been promoted in the game. Allamehzadeh had originally pitched the idea for the film to the BBC, but failed to reach an agreement with the organization. He blogged about the effort and caught the attention of Bahai playwright/actor Mansoor Taeed who contacted Allamehzadeh to see if he could help realize the film. Having read Taeed’s successful play, We Are Not Spies, Allamehzadeh recognized a likeminded artist and agreed to team up with him. Taeed suggested that he could raise funds from the Bahai community. Allamehzadeh agreed provided there were no strings attached. The rest of the $300,000 budget came from Take 7 Production’s Bijan Shahmoradi who had collaborated with Allamehzadeh in the past, notably in The Guests of Hotel Astoria. There was also a great deal of volunteer work by human rights supporters. Besides helping raise funds, Taeed played the critical role of arranging Bahai contacts inside Iran whose stories could be told. An elderly couple in the Iranian village of Eeval, a mother and daughter fleeing to Turkey, the mother of one of the Bahai leaders now in jail. We get to know their stories with a mixture of sadness, fury and, oddly, shame at our ignorance leading to silence about the persecution of Iranian Bahais. There was, however, one story in the film that made me proud to be an Iranian. To counter the Islamic Republic’s ban on higher education for Bahais, the group had organized an underground university so advanced that some universities across the world recognized its academic credits and accepted the graduates. Why does this make me proud as an Iranian? Because the brave and talented organizers, teachers, and students were Iranians who overcame astounding odds to build an institution that advances the future freedoms of the younger generation. It does not subtract one iota from my pride in this accomplishment that these Iranians happened to be Bahai. Does it make a difference to you? See the film, and think about it. I need to know more about Bahai persecution. I have friendswho belong to the Bahai faiyh. Replying to Dr. Santos, go to http://www.educationunderfire.org and find out about the persecution of Bahais trying to maintain a university underground. There is DVD “Education Under Fire” which can be purchased in kit form for showing at US colleges and universities etc. with an accompanying manual. 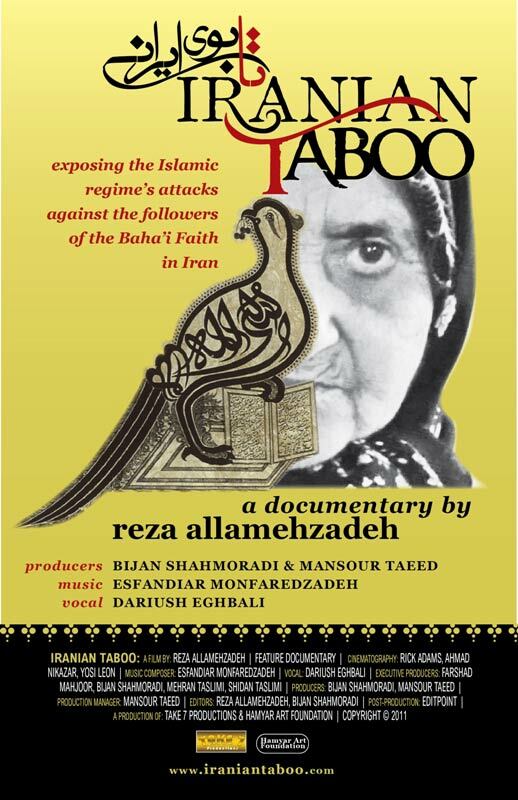 THANK YOU Reza Allamehzadeh for producing this historic documentary. The Baha’is of Iran have suffered for over a century and half. It is time for people, especially the Iranian population, to wake up, view this atrocity on the Big Screen and take action. May God bless all those who strive to bring about Justice in this world.